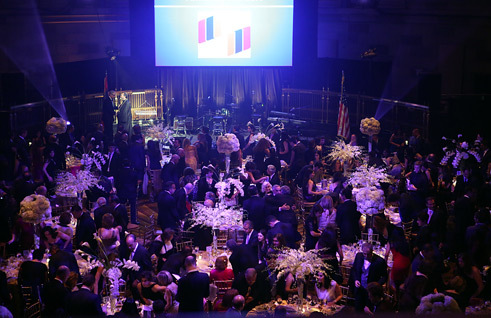 New York, NY — The stage was set for a grand celebration, as the Armenia Fund USA 20th Anniversary Gala commenced on Saturday, September 29th at Manhattan’s posh-perfect Gotham Hall. Located at the intersection of old world substance and digital-age functionality, the magnificent space proved worthy of the A-list participants, distinguished guests and valued supporters assembled in honor of the milestone occasion. On a clear night illuminated by a Harvest Moon, the seeds of celebration, planted over one year ago, flawlessly came to fruition. It was apparent to all that Armenia Fund USA had reaped an abundance of good will and admiration—over the course of two decades and, again, in the space of four hours. By 7:30 pm, the cocktails were flowing freely in the cozy Oak Room, an elegantly appointed mezzanine encased in rich wood paneling and overlooking the bedazzling Grand Ballroom. Once the festivities moved downstairs, the official program began in earnest with acclaimed mezzo-soprano Solange Merdinian delivering an impeccable, nuanced rendition of both American and Armenian national anthems. As gala host, renowned trial attorney Mark Geragos offered warm words of welcome. True to form, his exuberant personality and breezy charm didn’t disappoint. Clearly, Mr. Geragos possesses the same confident presence on stage as he does in the courtroom and in the media. Keynote Speaker H.E. 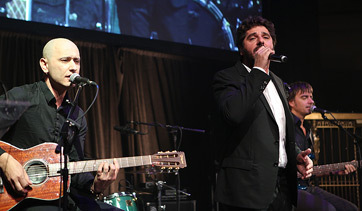 Edward Nalbandian, Armenia’s foreign minister, brought an appropriate level of gravitas to the tribute, while French-Armenian entertainer-extraordinaire Patrick Fiori, in his U.S. premiere, electrified the room—keeping a jubilant audience in the palm of his hands for well over an hour. A recurring theme throughout the evening was how the nation-building mission of Armenia Fund USA transcended divisions and cut across generations. The 300 guests in attendance attested to this fact, as they came from all community and institutional affiliations. Gathered together under the expanse of a neo-classic domed ceiling, they set a striking tableau of what Armenian unity looks like. 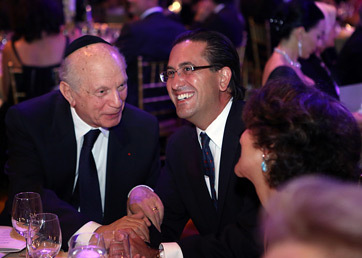 As Mr. Geragos observed in his opening remarks, “It doesn’t matter if you are from the Prelacy or Diocese, the AGBU or Assembly, or any other organization. You can check all that at the door,” he proclaimed. In a letter of congratulations from New York City Mayor Michael R. Bloomberg, Armenia Fund USA was again cited as a unifying force on the community level. “The Fund’s efforts have also benefited Armenian Americans, especially those across the five boroughs, and have united these individuals in a common purpose,” the letter stated. Unity also extended to the religious realm, with the presence of His Eminence Archbishop Khajag Barsamian, Primate of the Armenian Diocese (Eastern), performing the invocation, and His Eminence Archbishop Oshagan Choloyan, Prelate of the Armenian Apostolic Church of North America, delivering the benediction. The event was largely underwritten by The Hirair and Anna Hovnanian Foundation, in addition to co-sponsors from the local business community, including: Acopian Power Supplies; Brach Eichler, LLC; Cullari, Carrico, Soojian, Bruke, LLC; Estreich & Company, Inc.; Harvest Song; Michael Aram; The Tiger Buying Group; Toufayan Bakeries®, Worldwide Express®; and Anonymous. As honorary chairs of the gala steering committee, H.E. Ambassador and Mrs. Tatoul and Anna Markarian and H.E. Ambassador and Mrs. Garen and Nana Nazarian did their part to widen the circle of distinguished guests, while Gala Committee Chairperson Vesna Markarian and committee members Kristine Toufayan Casali, Alex Karapetian, Aline Markarian, and Lorig Setrakian mobilized the large presence of young professionals. Such an infusion of youthful energy bodes well for the Fund, as it raises the funds necessary to support its current and future nation-building efforts. Speaking of funding, Mark Geragos, who is a member of the All-Armenian Fund board of trustees, assured donors that their contributions are appropriately distributed. “To those who ask, ‘well is the money going to get there?’ I can tell you that I have been there repeatedly and I’ve looked at the projects. I can tell you that we’ve got an outside accounting firm that goes and actually does the construction quality. 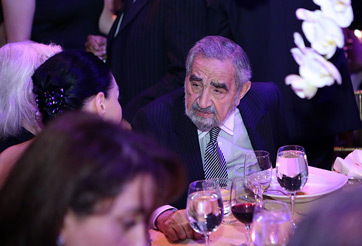 And I can tell you that the money is used and benefits the Armenians who are there,” he declared, adding that, unlike most organizations, only eight percent of the funds raised go to administrative costs. Then Mr. Bandazian pointed out how all the activities of Armenia Fund over the last 20 years mirrored that of Armenia. “When it became apparent that Armenia needed a lifeline to connect to its brothers and sisters in Karabakh, they called Armenia Fund; and we built the Goris-Stepanakert Highway. When Karabakh needed an artery to traverse its mountainous landscape, they called Armenia Fund; and we built the North-South Highway, the ‘backbone of Artsakh.’ When new healthcare facilities were required in Karabakh, they called Armenia Fund. 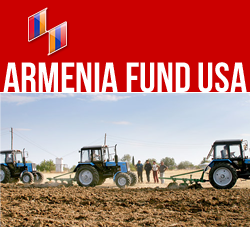 When Agriculture development became paramount, they called Armenia Fund. They tell us what they need and we respond in kind,” he concluded. 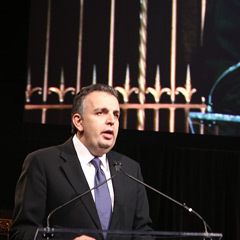 In closing, Mr. Bandazian recognized the invaluable contributions of his predecessors, who “set the tone and became the role model for other affiliates.” He cited former chairmen Berj Setrakian, Hagop Kouyoumdjian, Kevork Toroyan and Raffi Festekjian and acknowledged Hirair Hovnanian, Louise Simone Manoogian, George Pagoumian, Sarkis Acopian and “countless others’ who had gone above and beyond the call. “This is a truly national collaborative effort,” he stated, ”that deserves a round of applause.” The audience responded effusively. By all accounts, however, it was Irina Lazarian, the affiliate’s longtime executive director, who emerged as hero for her deft management of the many moving parts that an extravaganza celebration like this one entails. Mr. Bandazian thanked her “both personally and on behalf of the board of directors” for her “tireless commitment, hard work and dedication over the many years.” The rousing and sustained applause seconded the motion. Reducing two decades of achievement down to its simplest terms is no easy feat. Yet the anniversary organizers managed to effectively define the core mission in the simple but powerful slogan, “Building A Homeland Built to Last.” These words really hit home, however, in the short film presented midway in the program. In a refreshing departure from commemorative videos of the past, this high-quality production featured an ensemble of professional actors and an inventive, fast-paced interplay of imagery and space. Directed by Roger Kupelian, written by Kathryn Manuelian, produced by Sona Stamboltsyan, with cinematography and editing by Garen Mirzoian plus original music by Greg Hosharian, the film was extremely well received. It can now be viewed online via the Armenia Fund USA website. In turn, the Armenian Ambassador to the United States H.E. Tatoul Markarian made some interesting observations of his own. He concluded by announcing that, “as an appreciation of the accomplishments of the Armenia Fund USA,” its chairman, Khoren Bandazian had been awarded the Republic of Armenia’s Presidential Medal. That begged the question: what is the role of all Armenians, individually and collectively, in creating the kind of ‘home’ they would like. That “depends on the contribution of the generation of today's Armenian people and...to what extent the walls of our home would be high and safe; ...whether its light would be visible from all corners of the world, bringing pride to all of us and our coming generations, ” he said. 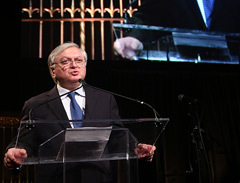 Foreign Minister Nalbandian also addressed some sensitive issues, commenting that “regardless of how the Armenians live in different parts of the world,” he said, “in a modest hut or luxurious mansion, foreigners judge us by the resistance, beauty and safety of the house called Armenia. Today foreigners follow how Armenians have built their home. Most of them are friends, but there are also those who want harm. They are not many. I do not think they are more than two,” he said, clearly referring to Azerbaijan and Turkey. The relevance of national security to the work of Armenia Fund was not lost on the audience. Given the realities of depopulation, especially in rural communities located on Armenia’s and Karabakh’s borders, Armenia Fund stresses the importance of national security by strengthening these rural border communities. Ongoing, large-scale initiatives such as the “Water is Life,” “Rural Development” and “Our Shushi” are all aimed at growing these rural economies, expanding the agriculture sector and improving health care delivery so that these strategic vital communities can become good places to live, work and raise families. No sooner did French-Armenian Patrick Fiori take the stage, than the audience members realized they were in the presence of pop royalty and witnessing the rise of a new star in the Armenian-American firmament. The consummate showman opened with an unexpected detour to another time and place with a mesmerizing rendition of “Les Montagnes D’Armenia.” He then followed with a series of poignant love ballads like “Si Tu Revenais” and “Je Ne Serai Jamais.” When it came to “Belle,” the signature song from his days in the French musical Notre Dame de Paris, Mr. Fiori stepped down into the audience and serenaded a glowing Lucie Bandazian seated next to her husband Khoren—the mastermind behind Mr. Fiori’s benefit performance that night. From the elated reception of the audience, it appeared that Mr. Bandazian’s idea to invite Mr. Fiori to be the featured entertainment was more like a stroke of genius. The enchantment continued punctuated with a prelude performed on the duduk by Mr. Fiori, followed by “Dele Yaman” as an introduction to “C'est un pays que je ne connais pas” (“It’s a country that I do not know”). Then, without missing a beat, the versatile vocalist, accompanied by a five-piece band, switched gears with a few up tempo numbers such as “A La Vie” and “Peut-Etre Que Peut-Etre which segued to a French-language version of “My Way.” Performed in a Spanish gypsy-style arrangement, Mr. Fiori made this quintessentially American classic all his own. By pouring his heart and soul into each and every number, Mr. Fiori made a visceral, palpable connection with the audience. People swayed in the aisles, danced in their seats and clamored for more. When he began singing an encore performance of “My Way,” the entire crowd rushed to the stage, dancing and clapping till the show was over. Later, his manager mentioned that, in agreeing to do the benefit performance, Patrick had to interrupt his long-running European concert tour. This meant flying to New York for two nights and getting right back on the plane the next day. Mr. Fiori explained why he felt compelled to come. “I had performed in Armenia several times and, each time I returned, I would notice how much progress had been made. 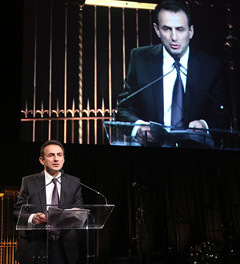 Because of organizations like Armenia Fund.” When asked about any plans to return to New York to perform for a wider audience, his manager noted that with the 50,000 French people living in New York, there was a ready-made following. Add to this the newly converted fans from the evening’s performance, and the prospects look all the more promising. 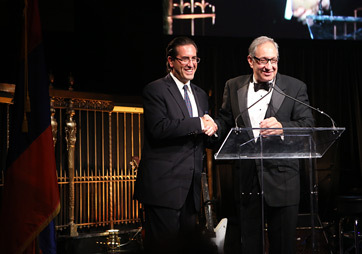 At various pauses in the program, Mark Geragos, who will be hosting the Armenia Fund Thanksgiving Day Telethon for the 10th year and personally sponsored a table at the event, encouraged the guests to “put their own imprint on the future of the homeland” by sponsoring an Armenia Fund project. He turned their attention to the commemorative booklet, which included a catalog of naming opportunity projects in both Karabakh and Armenia. Giving levels start as low as $1,000 to fund pre-hospital equipment for one ambulance and go up to $350,000 for a complete water delivery system for one village in Karabakh. By evening’s close, Mr. Geragos happily reported that several pledges had already been made, with more on the way. For starters, Mr. and Mrs. Levon S. and Laura Ariyan pledged $2500 to fund an art classroom at the Abovian School in Shushi, while Victor Zarougian and wife Judith Saryan decided to fund a new computer center at Mardakert’s Vaghuhas School at the $10,000 level. A night to remember. A future to embrace.